Guess what Amazon FBA sellers – if you’re selling via FBA on Amazon.com, Amazon by default does not list your products in the second largest state in the USA. That’s right- your products are not eligible to be purchased by over 35 million consumers. This state is of course none other than Canada. OK, Canada being the 51st state is about as cliched of a Canada joke as you can get. But in all seriousness, Canada is a big country that’s closer to most Americans than Miami or Anchorage is AND you’re not selling to these customers if you’re simply selling your products on Amazon.com. If you feel like you’ve tapped out all of your maximum potential on Amazon.com, Amazon.ca is a relatively painless way to increase your sales by an extra 10-20%. Why should you sell on Amazon.ca? Canada has about 10% of the population of the US so simply by this math you can expect about a 10% sales boost for any one product by selling in Canada. However, for almost all products on Amazon.ca, the competition is much MUCH less than Amazon.com so a 10-20% boost is more reasonable. As Amazon.ca becomes more popular with Canadians, competition will continue to increase. For this reason alone, I think if you have goals of one day expanding to Canada now is the time to do it to solidify your reviews and rankings in Canada and get a first-mover advantage. One of the other benefits of selling on Amazon.ca is that you can use multi-channel fulfillment to ship Canadian orders from your website to Canadians direct from Canada. This avoids duties and long transit times and is a big positive for Canadians. Canada also has a much easier sales tax process than in the U.S. Canada has what they call a harmonized sales tax meaning there’s only one tax to collect for most provinces (I’ll get into this shortly). Who Shouldn’t Sell on Amazon.ca? Selling on Amazon.ca isn’t hard, but there are lower hanging fruit for achieving similar sales growth. That list isn’t exhaustive, but it gives you an idea that there are easier things to do to grow your sales by 10%-20% than by selling on Amazon.ca. For my company though, I feel like we’d eaten all of the other low hanging fruit and selling on Amazon.ca was a natural expansion area for us. We are not accountants, but normally income you make in Canada will likely be exempt via tax treaty (assuming you have no permanent establishment in Canada). The reverse is true for Canadians doing business in the U.S. Check with an accountant to be sure of your tax liabilities though. However, you will definitely be subject to a sales tax liability. Product safety requirements, labeling, etc are normally very similar to the U.S. (opposed to, for example Europe, where they are much different). As always though, check with a customs broker to be aware of any potential importing requirements before importing. Canada has a significant French population, particularly in Quebec. By law, all mandatory label information be shown in English and French except the dealer’s name and address. This normally includes the product name and net quantity/measurement information. Directions for use, promotional/marketing statements do not have to appear in French. This information is generally not checked upon import and, for better or worse, many private label sellers do not adhere to these labeling requirements. To sell on Amazon.ca, you can continue to use your American bank account and Amazon will simply convert the funds into US Dollars (normally with about a 3.5% commission. There’s no need to setup a Canadian bank account. As an American, you cannot come to Canada to work without a Visa. There’s certain activities you can perform in Canada for business, like visiting an accountant, visiting a client, etc. In other words, you can sell your goods on Amazon.ca and essentially pay good Canadian employees to ship your products but you can’t open up your own warehouse and start shipping products yourself without getting the proper work visa. And finally, a lot of Americans believe Canada is a national park located within the northern part of the United States. It’s actually not! Canada is a real autonomous country formed in 1867 with its very own Prime Minister (sort of like a President). Canadian duty rates are often higher than the U.S.
You can more or less charge the price you charge on Amazon.com, converted to Canadian dollars of course. In fact, you might even be able to charge more. However, the exchange rate is volatile. 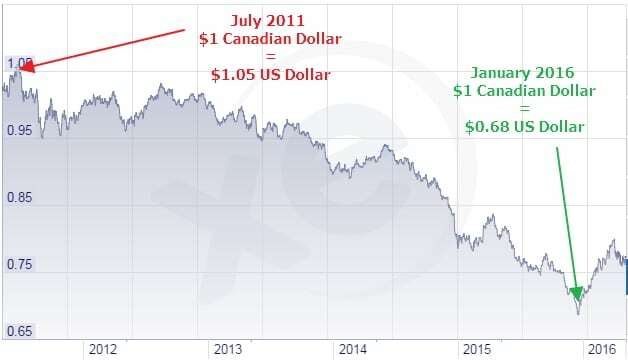 For example, in 2011 the Canadian dollar was actually worth more than an American dollar but in June of 2018 a single Canadian dollar is worth about $0.75US. You want to keep an eye on the exchange rate, if not monthly, then at least quarterly. We adjust our prices many times throughout the year to reflect changes in the exchange rate. Canadian duty rates also tend to be 25-50 higher than in the U.S. (ignoring the 2018 China-U.S. trade war). If you import goods from China into the U.S. and then re-export them to Canada you have essentially double paid duties for both Canada and the U.S. (it’s technically possible to file to get your U.S. duties back but the paperwork is very pricy). Pro-tip: The country of origin of your products never changes. For example, if you import a widget from China to the U.S. and then import it into Canada, Canada still considers that widget “Made in China”. Also, with Amazon, there are no partnered carriers for shipping your goods from the U.S. to Canada. You need to arrange shipping from the U.S. to Amazon.ca warehouses on your own. You will also need what Canada calls a Business Number to formally import into Canada. It’s easy to file for though. When you’re shipping to Amazon.ca FBA you must make sure that all duties and taxes are paid prior to arriving at Amazon.ca. With UPS and FedEx you can ship via “DDP” (Delivered Duty Paid) which will basically have these charges passed on to you and keep Amazon from rejecting your shipment. Canada has a federal sales tax that is called GST/HST. Compared to the U.S. it is extremely simple. Each province sets it’s GST/HST rate, there’s only 13 provinces/territories, and you remit everything on one form. There are four exception for Amazon.ca sellers: Quebec, British Columbia, Saskatchewan and Manitoba which have provincial sales tax (similar to sales tax in the U.S.). Not registering will not affect your ability to import into Canada or sell on Amazon.ca but you are supposed to collect these. Further, Quebec has a significant economic threshold of $30,000 that you may not exceed and Saskatchewan and Manitoba have a total population of less than 2.5million. For better better or worse, many international sellers never register to collect provincial sales tax. You cannot and should not skip out paying GST/HST in Canada. Technically anything you ship into Canada needs a business number (there’re ways to get around it with UPS/FedEx which I address below) so there will be a record of anything you bring into the country. So this means, at some point, a Canadian Revenue Agency agent is going to see you shipping a lot of goods into Canada and never filing a GST return. At some point the Canadian government will track you down. Here’s the easiest way to get started selling on Amazon.ca. Send a small shipment to Canada – get your feet wet; Work it up to Pallets. List your products on Amazon.ca. Turn on Sponsored Ads for Canada! As you probably did when you first started with Amazon.com FBA, you probably sent in a box or two of goods to test out FBA, and not a full 20′ container. The same goes for Amazon.ca. Send a box or two via UPS or FedEx to get your feet wet. The procedure is almost identical as sending to Amazon.com. You will need to send your goods via UPS or FedEx or another service that allows you to be billed for any duties and taxes, also called DDP. Do not send via USPS. If you do Amazon will be asked to pay taxes when your product arrives and they will reject your shipment. Pro-tip: In America, there is an $800 de minimis value (any orders less than this do not have to pay duties/taxes). In Canada this de minimis value is just $40. When you sell your products on Amazon.ca you will need a new Amazon.ca professional account and you will also need to re-upload your products to Amazon.ca. Your inventory from Amazon.com does not transfer over to Amazon.ca. However, you manage your Amazon.ca from within one Seller Central account. There’s also a few other settings like shipping that you need to set-up for Amazon.ca but the whole process should only take a few minutes. You control your Amazon.ca and Amazon.com from one account using the drop down menu at the top of Seller Central. When you price your products in Canada, you’re likely simply converting from U.S. dollars to Canadian dollars and maybe adding a bit of a cushion. Monitor this exchange rate on a quarterly or monthly basis as it will change and you should change your prices accordingly. If you’re sending goods up to Amazon.ca FBA via UPS or FedEx as a trial, you can likely avoid this requirement for your first couple of shipments. However, once you do any significant volume you need a business number. If you’re sending anything that requires a customs broker to clear (i.e. you’re sending an LTL shipment) you will definitely need a Business Number. A business number is simply a number that you can use to collect/remit GST/HST and to import goods into Canada. It’s similar to the U.S. EIN. Registering for a Business Number in Canada is quite easy. You simply need to complete a form RC1. As of this writing, this form needs to be either faxed or mailed in (there’s no option for non-residents to do it online). Once you fill it in, you’ll be issued a Business Number within 10 days. When you register for this business number you can also get your GST/HST and Importer numbers – this is on the RC1 form you fill out. There are simply checkboxes for each one. Alternatively, your customs broker can register you for a business number for free or a nominal fee (under $500). Pacific Customs Brokers can help you with this (let them know that EcomCrew sent you). The form is self-explanatory and should take no more than 5-10 minutes (when it asks for social insurance number, simply leave this blank). When it asks for your estimated taxable sales in Canada it’s wise to enter something below $100,000 as otherwise you will be required to prepay half of your estimated GST (The Canadian Revenue Agency will determine in your second year if you need to prepay a percentage of your GST/HST). One final note, if you’re registering as a corporation, submit a copy of your Articles of Incorporation with the form. Pro-tip: If you want someone to set-up your business number and help with your sales tax filings you can contact David at Small Biz Pro – he has a lot of familiarity with non-Canadian sellers on Amazon.ca and can help you get set up for those who don’t want to self-register. Hopefully this article has outlined my arguments for why you should be selling on Amazon.ca (as well as who shouldn’t be) and also how to get up and rolling. Since late 2015, Amazon.ca has been a significant driver of growth for my company and I think it can do the same for a lot of other companies seeking 10-20% sales growth. Have you had any experience selling on Amazon.ca or other Amazon market places? Do you have any questions about selling on Amazon.ca? If so, comment below. Hi Dave. How do you gauge demand on Amazon.ca? Since reviews are so low I feel like it's not the best metric. Do you use any Jungle Scout style tools like ASINspector? The best way IMO is to divide the U.S.sales by 10 (or slightly lower like 8). You're right - the reviews are really misleading. I'm just getting started in white labeling products. Do you think starting with Amazon.ca makes sense? I thought it might make sense since Amazon.com seems saturated. I am curious, my company is planning selling our items on amazon.ca FBA. However what will become of the HST when we get a Canadian Business Number, I understand we will collect it from our sales, but we ship our item via Fedex so we will pay it when it come into the county. Will we get a refund for the second time paying the HST on the goods or just have to pay the HST effectively twice and only collect it once? You mean the HST you pay for goods that you import into Canada? This is an input credit that you get back when you file your HST so you don't pay HST twice. Great article David. When shipping from your suppliers do you tend to send first to Canada or the USA and then split the shipment, sending a portion to the other country? Is there an advantage to shipping to Canada over the USA, or vice versa? I tend to send to the U.S. first. Ideally if I can justify it, I'll have a small LCL shipment shipped from China to Canada, although often I end up having to ship from the U.S. back up into Canada. The major downside to doing it the latter way is that you pay duties twice - in the u.s. and in Canada. Thanks for a great article. I'll be listing in Canada next month. What about bilingual packaging? This seems like a legal requirement but seldom enforced? Hi David, I'm Canadian and want to sell on both .com and .ca. Do I have to set up Seller Central acccount in both or can I set up a .com account only and use for both? You can use one seller central account for Canada, the U.S., and mexico. Any advise for Merchant Fulfilled shipping? We don't use FBA and would like to ship directly into Canada. Our items are low weight( under 1 lb) low $, (6-10) and small. Do you mean shipping from the U.S. to customers in Canada? USPS is normally the cheapest. That is what I thought. I think I need to investigate. The whole tax situation by province and how I handle that. Plus whatever US customs needs me to include. Plus an import dues. Am I understanding it right: If i'll send from China to Canada 1-2 boxes of 150 total units as a trial, I can avoid paying any taxes, correct? Or should I still pay duties? If so: How do I get billed if shipment (Fedex, UPS) is made by China supplier? I'm not sure where the $150 figure came from but Canada's 'de minimis' threshold is $20 (meaning anything above this gets tax charged on ). Fedex/UPS will give you a bill upon delivery for the taxes/duties/brokerage. Hi there great article! I have a question. On Amazon certain products like books can piggy back through a listing already made. Is that possible with Amazon CA? Yes, you can piggy back on any existing listing on Amazon.ca as long as you're selling that exact product. David Such a uselful article. We are selling in Uk Europe since lat 7 years and in USA we setup FBA since last 4 years. As a british citizien i formed a inc company in USA. We want to expand our business on Amazon.ca with FBA. What do you suggest. Our volume is always high and we can easily go up to 100k in a year. Short term you can ship in via Air Courier without really needing to do anything else. Long term you will need to setup a business number - a customs broker like pcb.ca can help with that. 1) Like many US sellers, we have drop shippers selling our products on Amazon.ca. The ASIN in the same, they are I guess using our same UPC etc. That means that I will need to take over their listings when going to Canada rather than creating new, correct? Have you ever heard of anyone having issues with this? 3) This is a bit of an accounting question, but you touched on it so I will ask:) If I am a company registered in someplace overseas & I'm not American, do I need to pay profits tax to the CRA? I am getting conflicting feedback on this but if so it kind of kills all my eagerness. 1) You can try to take over the SKU, which will be messy, or just sell from the pre-existing sku. 2) I'm not sure actually. 3) I'm not a tax expert but I believe it will depend if the country you're registered in has a tax treaty with Canada. If so (which most developed countries do) you would only need to pay sales tax. I am a full-time gradute student just starting to import from China and selling on amazon via FBA. As a trial, I just placed my first order on Alibaba for 120 bracelets worth of a total $98 being shipped by DHL/FedEx to Vancouver. I neither have a import/export account nor a registered business. Am I allowed to import as an indivisual with no business affiliations for resale? I am concerned this would be against the law. Your answer is highly appreciated, thanks in advance. David, this is very helpful and I didn't have to go through a CPA who would charge at least $500 for tax issues in Canada. I thank you for your kind explanation for starting business in Canada via Amazon.ca. do you advice me ? Business number and GST/HST number are more or less the same and I believe a business number is all you should need to clear into Canada. I'd contact pcb.ca and tell them what you're trying to do. They can do your customs paperwork for you and also make sure you have everything you need. Do you have the ideal number (in CAD$) you should purchase your products for from suppliers? I know Amazon.com ideally your product cost should be around $5 per piece. David, thank you very much for all your efforts and support! We are planning to start doing business with Amazon.ca FBA. Are the prices displayed on Amazon.ca including the taxes or are they net and the taxes are added once the customer has provided a delivery address? The issue is how to calculate the price per item send to Amazon. Sorry for the late reply. Tax is charged ON TOP of the purchase price. Hi David Incredible Article very articulate and 1st I have seen that gives details from start to finish on amazon CA. One question: I did UPS around 2 months ago from US to Canada via fba and the warehouse in Canada did not take the inventory UPS had to return it back to me. How do I send it from my location in U.S. to amazon canada warehouse? Yes, I had the same thing happen to me. You need to make sure the freight is going "DDP" aka all of the charges get billed to you and not Amazon. Thanks for reply.One more question.My product has 18% custom duty in Canada and 5% gst to add.My other company sell to my NRI company at $10 per peace.Mean i have to pre pay duty $2.30 per peace in advance considering 22% total tax.Now when i sell through amazon.ca at $30 per peace,then after one year filling tax i have to pay tax 22% on $30 sell and credit for advance already paid at my cost of purchase at $10.This is correct.I have to pay income tax in Canada or only in USA . I've never heard of adding Amazon.ca adding more scrutiny to your .com. Maybe things have changed though. To sell on Amazon.ca, you can continue to use your American bank account and Amazon will simply convert the funds into US Dollars, albeit with a terrible exchange rate (Amazon will take about a 3.5% commission). There’s no need to setup a Canadian bank account. Would you recommend a bank account that transacts in CAD? I would suggest looking into TransferWise's crossborder bank accounts- you'll get a much better rate when exchanging. We are planning on starting international shipping for both our website and on Amazon after reading your article. Thanks for writing it, and for providing all of the helpful information. We think 10-20% growth is very achievable and appreciate you getting us motivated. We would really appreciate it if you could help us with a couple questions. Has FBA Export removed the need for shipping product into Canada for sale on Amazon.ca? If not, what are the pro’s and con’s of each method (FBA Export vs. Amazon.ca)? Also, any recommendations for shipping to Europe? Australia? New Zealand? I am currently helping a US Corporate client move through getting tax and business accounts set up. The one item I feel you may not be accurate on is that there are 5 sales taxes sellers may have to remit. HST/GST, BC Sales Tax, Saskatchewan Sales Tax, Quebec Sales Tax, and Manitoba Sales tax. So a warning - If you sell in those provinces you need to collect those sales taxes in addition the GST/HST. I believe Amazon.ca allows you to exclude selling in specific provinces (not absolutely certain). Also just an FYI in response to some of the comments I read that may prove to be helpful for readers. When an American individual or corporation applies for a CRA Business Number I would also note that at the same time they can apply for the GST/HST and Importer numbers - this is on the RC1-17e. Check boxes for each one. American's must collect HST/GST once their worldwide sales go over $30,000 (not just their Canadian Sales) and the threshold for Provinces that have sales tax is different or non-existent. So what this means for the vast majority of sellers is you should have your taxes accounts set up before you start selling on amazon.ca because you should be charging tax right away. Apparently amazon.ca has told sellers from the US to just build the tax into their price until they get set up with tax accounts. Doesn't seem the smart way to do things. You will also be required to provide a security payment to Revenue Canada if you expect your Canadian Sales to be over $100,000. There is an exemption to this that can be signed off on. It can take over a month to get all the provincial sales tax accounts set up. Each process is cumbersome, and different. Thanks again for posting this blog, very helpful. Thank you David for the excellent follow up. I will modify some of the information to reflect this. In regards to the different provincial sales taxes, I'll clarify this regarding the provinces. I believe Saskatchewan has voluntary remittance for out of province sellers. BC and Quebec are the biggest provinces people should be aware of. Manitoba has a fairly negligible population and one has to weight the costs of selling there. Do you have referal for any company for the follwing service? 1. help us to setup all IOR so we can import into amazon fba Canada warehouse(or if there is any way we can use third party IOR to import? 3. bookeeping and tax accountant, for us to pay/claim GST, and clarification on business income tax in Canada. I have an existing Amazon Seller Account in .com have been selling a few private products for about 4 years, doing okay. My wife has a new Amazon Seller Account in .ca and would like to import and sell my .com products. Separate bank account and company name from the .com account. The Canadian Company is incorporated with Business Number and GST Number. 1. Do you foresee any problems with this? 2. Should we create a totally new listing? It will use the same labels and UPC code though. Thank you for your informative articles. I am a Canadian seller looking to launch my first product on Amazon.ca. Ideally, I'd like to get my first trial order shipped via air express (air courier) to avoid the hassle of finding a reputable freight forwarder and customs broker, plus avoid any hidden costs. I should say that the order will be shipped from my supplier directly to the FBA warehouse in Canada. As far as I know, all air express orders need to be shipped with DDP terms, is that correct? I just got a very expensive quote for air express from my supplier and I'm trying to make sense of it. Typically air express is about $7/kg but the quote she's given me is a little over $12.5/kg. Can you provide any insight into why this would be so high? Is it because of the DDP terms? I can provide additional information if you need it, but I would really appreciate your feedback and expertise because it can be a bit daunting and overwhelming trying to figure everything out myself. $7/kg is on the low end. $12.5/kg isn't astronomically higher so it could be any number of factors, it's a peak season, documentation and other fees are included. Suppliers generally don't gauge on the shipping but they also do not shop around for the best rates so keep that in mind. I am located in Canada and getting ready to place my first order from China which will be shipped directly to the FBA warehouse in Canada. I would like to get the first order shipped via air express so I don't have to worry about finding a trustworthy freight forwarder right now. Is there a general rule of thumb for when it makes sense to ship air express instead of air freight or sea freight? The order weight is approx. 248kg (16 boxes) and my supplier has quoted me about $6.4/kg which seems pretty good to me. Can you provide any insights or thoughts on this? Also, am I correct in thinking that the shipping terms have to be DDP not FOB with air express to make sure there are no charges billed to Amazon upon delivery? Your help and expertise is much appreciated. General rule of thumb is right around that 250kg mark sea freight starts to make more sense. You're right at that limit so both rates are probably going to be pretty comparable. Yes $6.4/kg seems pretty good but sometimes the devils are in the details (i.e. surprise fees). I also assume that is to a local airport - keep in mind someone will still need to pick these goods up from the airport warehouse (it is NOT door to door delivery) and a customs broker will need to be used to clear customs for you. Thanks for replying. Wouldn't it be door-to-door delivery if it's shipped via UPS Express Courier? Wouldn't UPS handle the customs clearance for the order? Sorry I was just thinking it was air freight. If it's going UPS it is normally quoted door to door and that rate is very good. And yes, they should handle the customs (but they'll be charging you for it). You are a wonderful resource!! If we use a fulfillment service in Canada to receive the imported books and sell them in e-commerce to our denomination's Canadian churches and members, will we have to pay Canadian Income Tax on the money the fulfillment service remits to us in the US? Can't find the answer elsewhere, so your help will be much appreciated! I can't say for sure but normally if your country has a tax treaty with Canada it will make a lot of it null. I'll give the obligatory- talk to a tax professional. Great article, Dave, thank you for sharing. We are looking to expand to Amazon.ca (currently .com) but are trying to decide on FBA or FBM. Anything you can suggest to help us decide/what is best for tax purposes? Our product is made in the USA so we don't have int'l suppliers to ship directly to CA, all products come directly from us. We use FedEx and will continue to. Is any of the info. in the article different than if we chose FBM (as it relates to paying GST/HST)? If you do FBM from the U.S. to Canada you don't have to worry about collecting GST/HST. If you fulfill from within Canada, whether or not you use FBA, you'll still have to pay GST/HST on all orders so there's not a significant difference. I am thinking of sending my goods directly to Canada to a 3PL warehouse and from there into Amazon. Do you have any recommendations for Canadian 3PL who are familiar with Amazon prep and processes? Hi Charlotte - most 3PLs are familiar now with Amazon. Try www.integratedfulfillment.com though - they're good people. Great article and great podcast! Do you have a general rule of thumb on how much to increase the US price of a product when listing it for sale on Amazon.ca? In your podcast you mention the HST tax, duty fees to import into Canada, customs fees, currency conversion fees, the difference in currency exchange rates and the higher cost of shipping. Is there a ballpark percentage that can be used to add to the current US price to get close to what you should be charging in Canadian dollars? Increasing them 50% is a safe bet. It's going to vary though depending on the duty rate of the item and the currency exchange at that point in time. 1) Do most companies that do CA FBA use an accountant to handle all the GST/HST and provincial tax filings? Is that were David comes in? 2) Does getting a BN for our US company create nexus there where we have to file Canadian income tax returns? 3) How does this affect the partners of our US LLC...would that income flow down to them that would require them to file Canadian tax returns too? Thanks for the help! Any advice would be appreciated! 1. Yes most people would use an accountant at least for registration (remitting is very simple). Registration is simple though and can definitely be done on your own. 2. Not my expertise but normally tax treaties avoid you being double taxed. Is the dave at smallbizpro.com right email address? I of course changed the at to @ and took out the space. But the email was bounced back to me. Thank you for the heads up !! It should be smallbizpro.ca (not .com). I'll correct the article. 1. I would need a brokerage company to bring the product over correct? 2. is the product still fulfilled by Amazon? 3. Would the product still be under warranty? 1. If you're shipping to FBA in Canada, and not shipping it directly to the customers in Canada. 2. If you ship it to FBA in Canada. 3. Not sure - depends on the product's warranty. This week I received the Canadian Business number for my company along with the Import - Export account and a Corporation Income Tax Account which I didn't request. I've been calling Canada Revenue and they insist that even though I have a U.S. coporation I need to have Corporation Income Tax account and the obligation to file an income tax return once a year, is this the case with you? I only requested a GST/HST and an Import-Export account when I requested my business number but they automatically enrolled me in the Corporation Income Tax as well which I think is not correct. I'm not an accountant but I wouldn't be surprise that you have to file a tax return, even if null. Again - filing and having tax due are two different things. I'm not sure which boat you fall into. You'd be best to talk to an accountant in Canada about this (there's a link to a good one here).